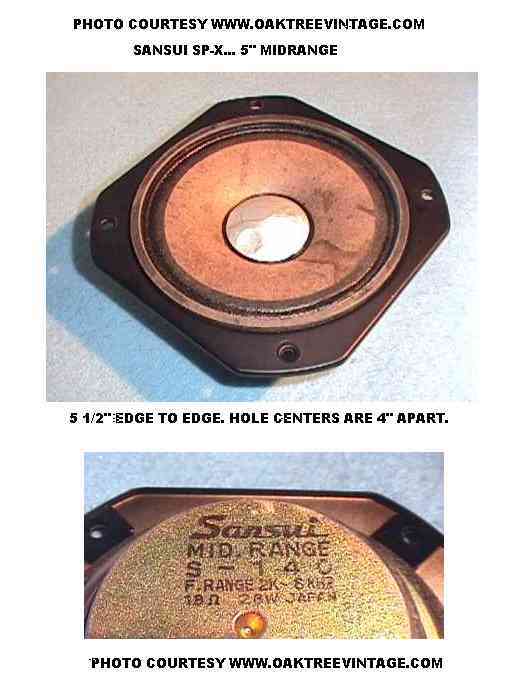 Sansui replacement speaker parts / spares for Vintage Sansui models. 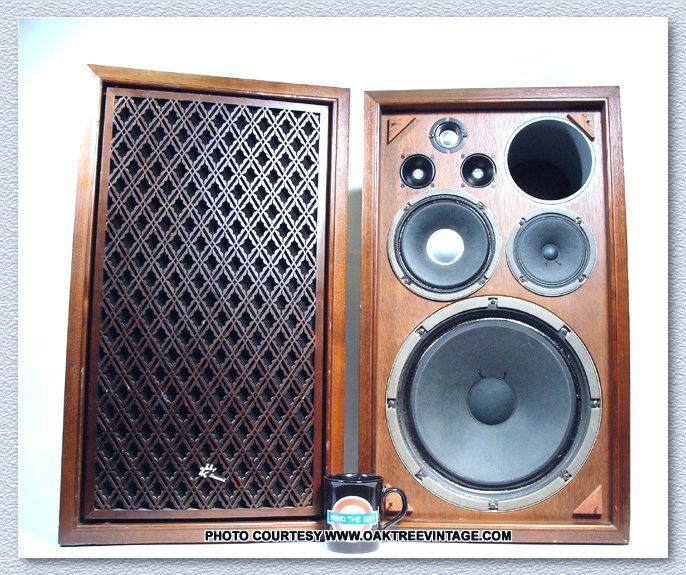 SANSUI SPEAKER PARTS / SPARES USED / VINTAGE. 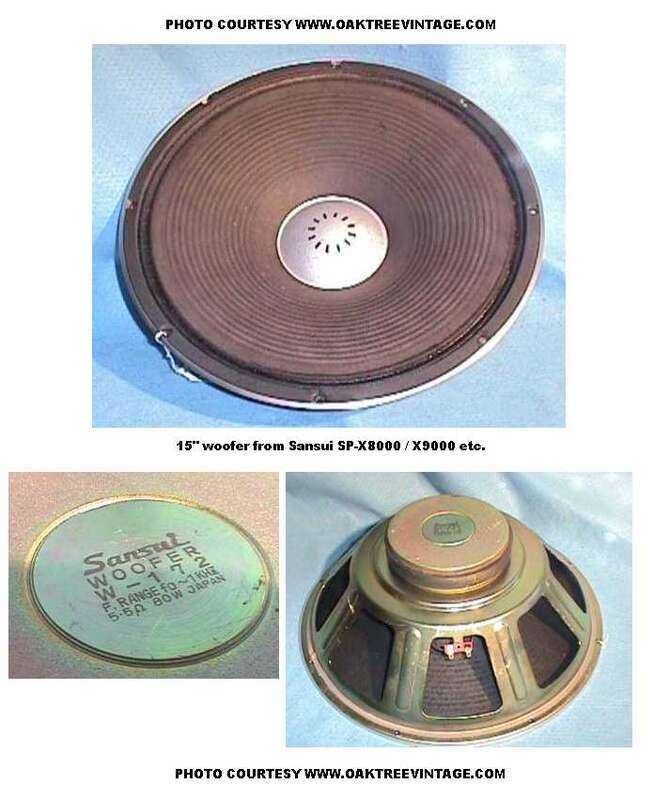 Sansui replacement speaker parts / spares for Sansui speaker repair of Sansui models SP30, SP-30, 50, 70, SP300, 300, SP1000, SP-1000, SP-1500, SP-2000, SP2000, SP-2500, SP2500, SP-2700A, SP3000, 3000, SP-3500, SP3500, as well as Sansui SP-4000, SP4000, SP-4000A, SP4000A, SP 5500X, Sansui SP-7500X, SP-X8, SPX8, SP-X7000, X7700, SP-X8000, SPX8000. 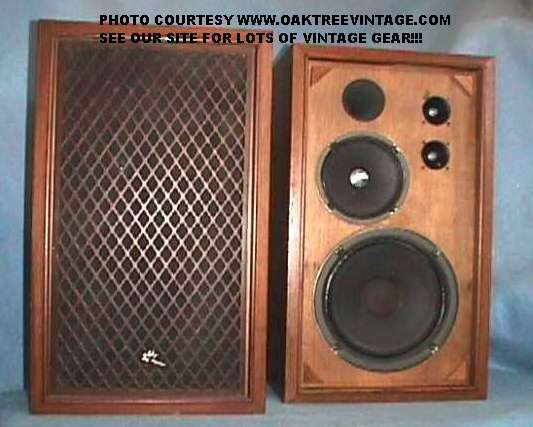 Replacement vintage Sansui speakers, drivers, woofers, Tweeters, mids, midranges, crossovers, cross over, cabinets & Grills / Grates / Screens / Front Covers. 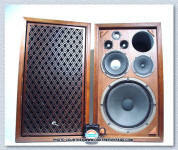 Sansui speakers / parts for Data Base info, specifications / specs, reference and occasional sale. 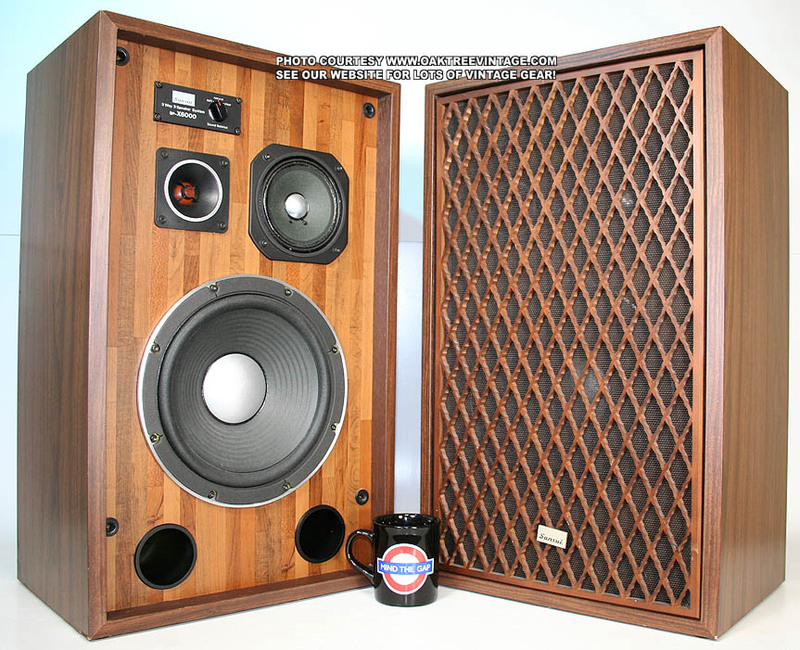 If you're looking on this page for 'Subwoofers' for the below listed models, or for most any 'vintage' speaker, those likely AREN'T SUBWOOFERS you need. They are most probably 'WOOFERS', and there is a difference. LINEAR MOTION Tweeters T-134 2 9/16"
DCR = 4.3 Ohms U 2 $95. ea. Good Cond. Dusty, but no tears, cracks, rips or surround separation. 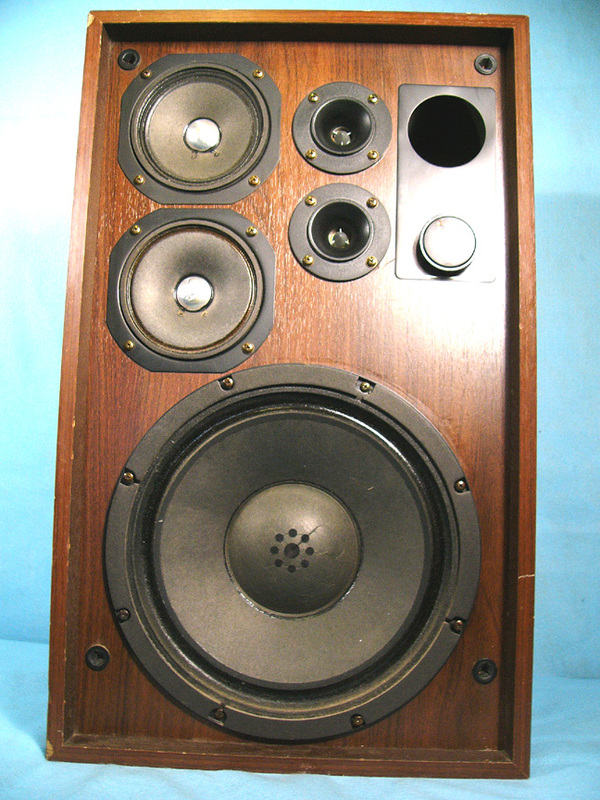 Function, but cone has perimeter separation near surround. 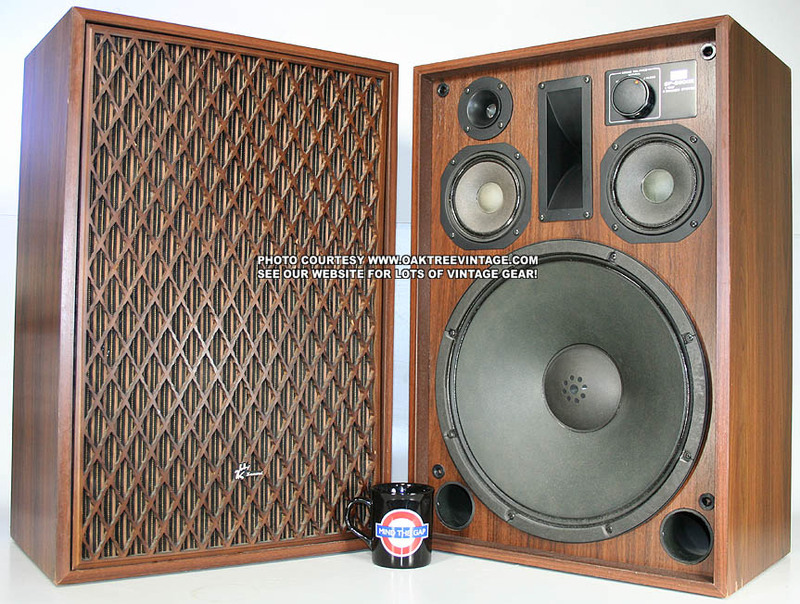 We may modify these with 'modern' foam surrounds, but price will increase if further work is done. 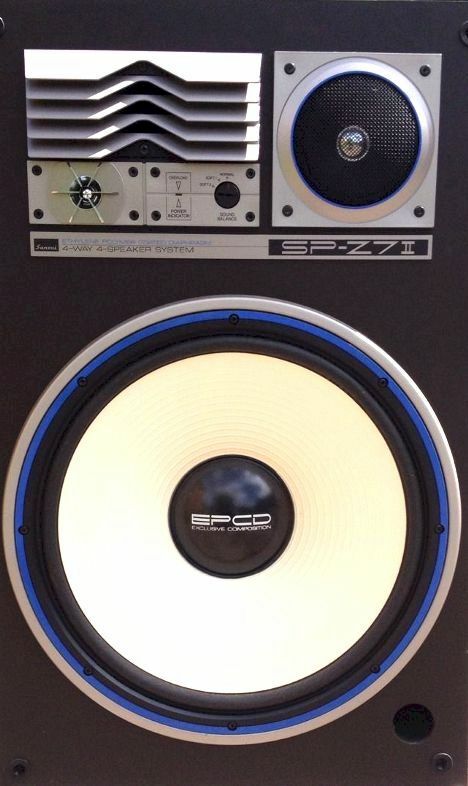 SP-7500X SP7500X Midrange S-130 / S130 8" 65 watts 8 Ohms U 5 $55. ea. Good Cond. 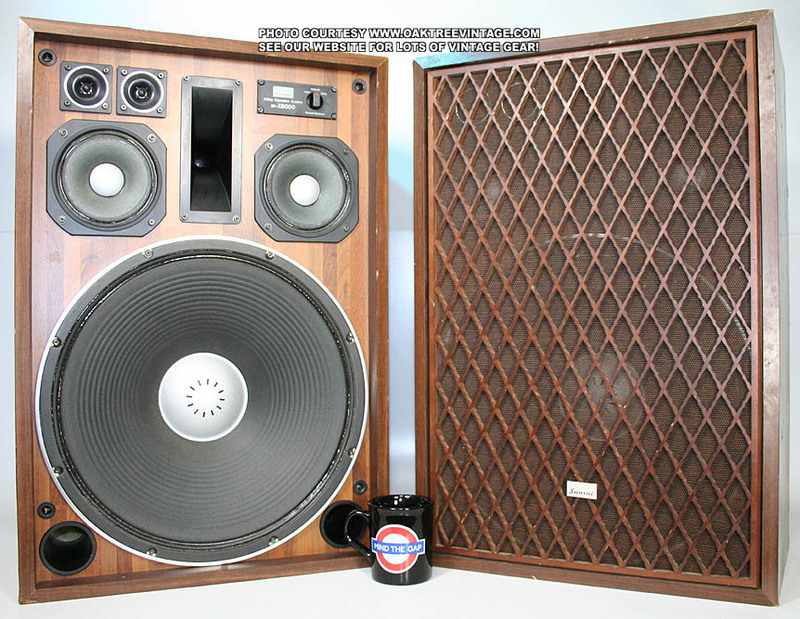 T-135 / T135 6" x 2"
DCR = 6.6Ω U 2 $65. ea. Good Cond. 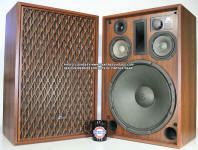 SP7500X Tweeters T-136 / T136 2" 15 watts 8 Ohms U 2 $35. ea. Good Cond. SP7500X Tweeters T-136 / T136 2" 15 watts 8 Ohms U 1 $15. ea. Dust Cover dented (cosmetics only). Torn cone. 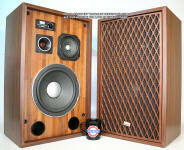 SP7500X Crossover - 4-way 130 watts - U 6 $55. ea. Good Cond. 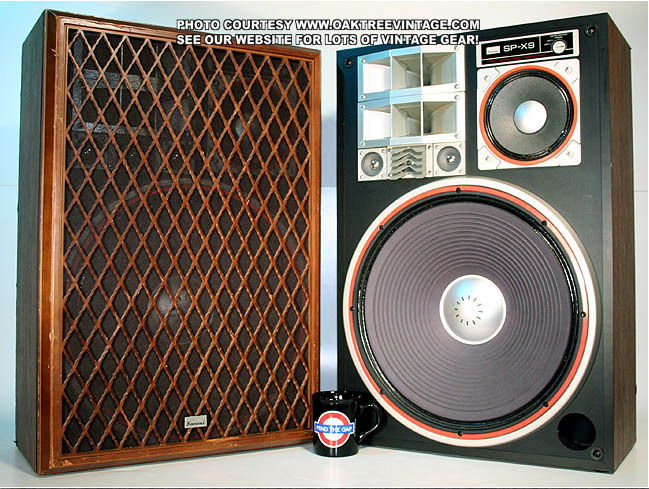 Knobs sold separately. Black w/ brushed 'brite' - - - U 2 $18. ea. Good cond. 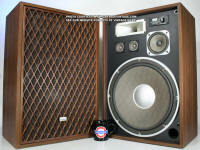 Woofers W-155 12" 40 watts 6.5 Ohms U 1 $55. ea. Winkles / creases to dust cap. Cosmetics only. Works. 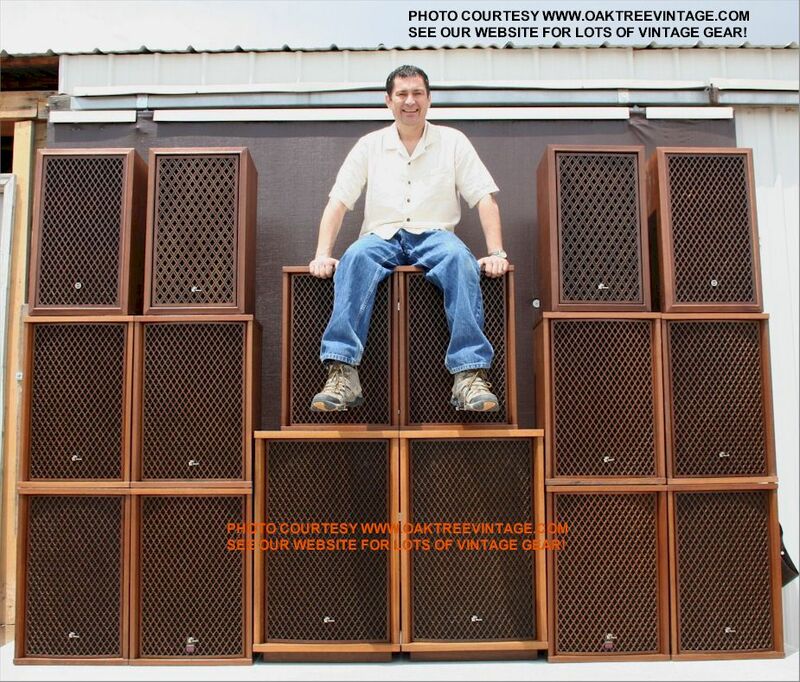 Good Cond and sound great. 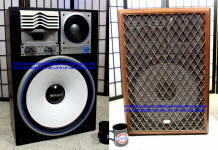 Also fits SP-2500X 5 1/8"
1k-10kHz Freq response 16 watts 12 Ohms U 1 $40. ea. (location shelves) Winkles / creases to dust cap. Cosmetics only. Works Good Cond. sounds great. -05 tweeter. 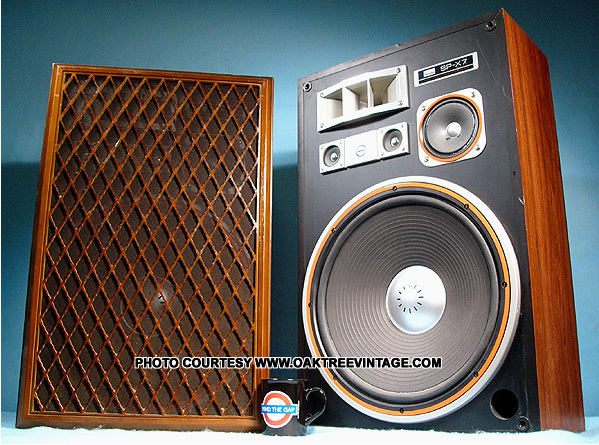 Differences are wattage, impedance and cosmetic in that the Kenwood has a concentric plastic Grills / Grates / Screens / Front Covers added over the front and the Sansui T-138 does not. Crossover SP-4000A 3-Way 100 watts 8 Ohms U 2 $45. ea. Good Cond. Pulp cone, Cloth Surround, Cast alloy frame, Ceramic Magnet, non-vented dust cap. 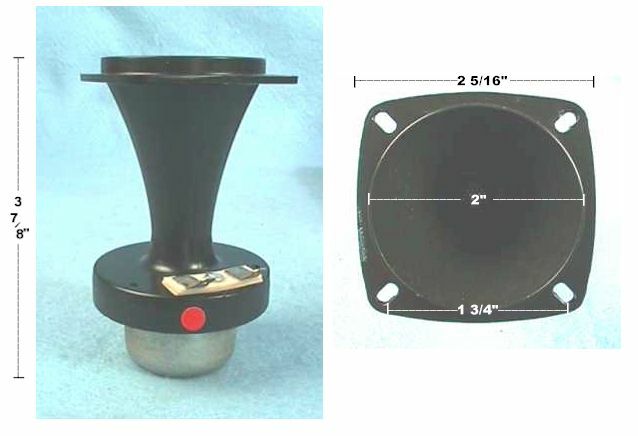 Pulp cone, Cloth Surround, Cast alloy frame, Ceramic Magnet, non-vented / Aluminum dust cap. but more MAY occasionally show up. Check back periodically. Cast Aluminum horn, AlNiCo magnet. but more MAY occasionally show up. Check back periodically. w/ 3 'wafer' attenuator switches. 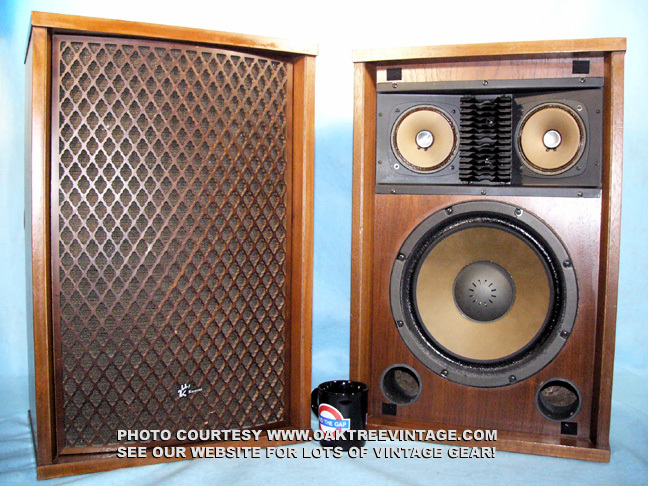 Original surrounds were 're-glued' and then swept with an AF generator. Pulp cone, Cloth Surround, Stamped frame, Ceramic Magnet, Vented, hardened pulp dust cap. DCR = 12.5 Ohms U 3 $45. ea. 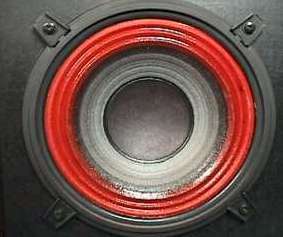 Coated pulp Surround. Stamped frame. AlNiCo Magnet, with integrated housing. Aluminum, dust cap. Midrange S-106 4.5" x 2"
Cast metal horn. Vented, Ceramic Magnet. Cast Metal, Radial horn. 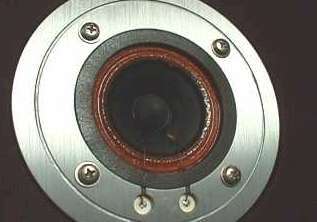 AlniCo Magnet. Crossover SP-3500 4-Way 100 watts 8 Ohms U 3 $65. ea. Good Cond. Knobs sold separately. Black w/ brushed 'brite' - - - U 6 $18. ea. Good cond. 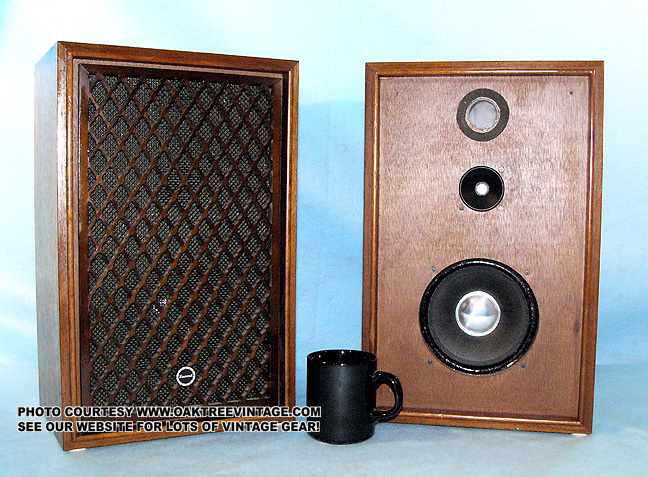 Wood Kumiko carved grills, w/ Sansui logo intact. Only very minor chips. No splits, separations, cracks, missing lattice or cloth pulling away. Overall, would complete a project to an 8.5+ rating. 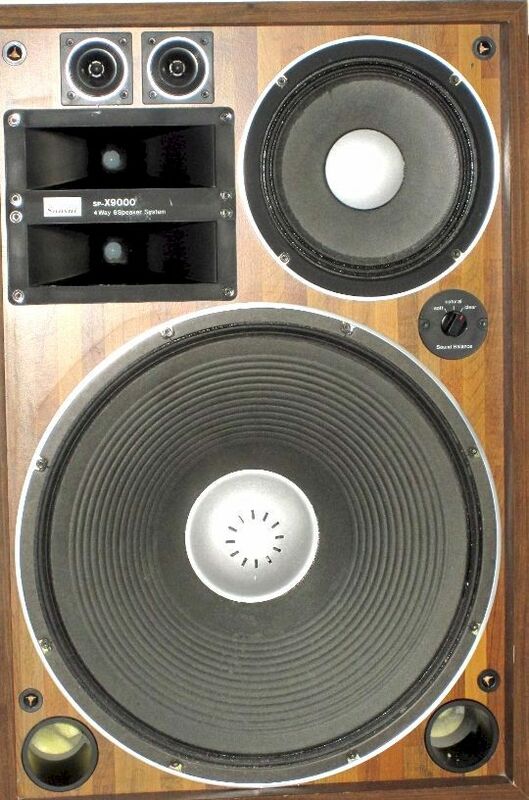 Currently works fine, but should probably have surround replaced by foam (not because foam is necessarily better, but because on all of these we've seen, the top 'peak' of the surround crease is fairly 'worn' and will likely 'tear through' in the not too far off future). 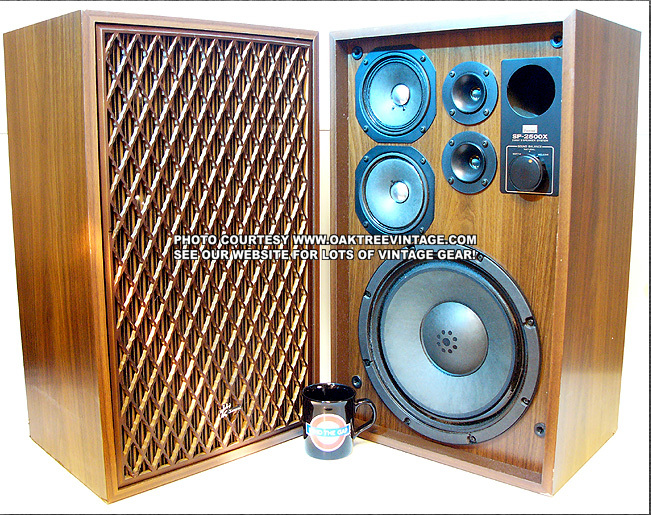 Stamped Steel frame, Pulp Cone, Vented Dust cap, Accordion surround, Ceramic Magnet. DCR = 4.5 Ohms U 1 $45. 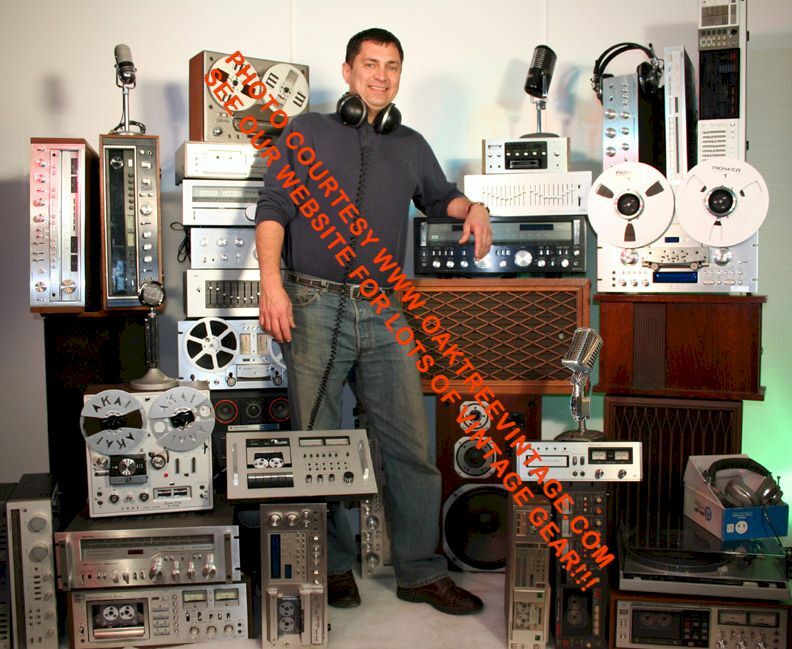 Has a buzz at most 'lower' frequencies. Fairly faint much of time, but doesn't pass our inspection. A new 'foam' surround might cure it.?. Also had a missing solder terminal, but has a braided wire extending from it to solder to. SOLD Work fine. Stamped Steel and 'Sealed / closed back' frame, Pulp Cone, Pulp surround, Ceramic Magnet. DCR = 6.7 Ohms U 1 $25. ea. Work well, but has few small tears / holes that are repairable (couple in center of cone radius and one near edge. Also, has small dimple in silver dust cap. Issues reflected in the price. Stamped Steel and 'Sealed / closed back' frame, Pulp Cone, Pulp surround, Ceramic Magnet. DCR = 6.9 Ohms U 2 $55. ea. Work great. 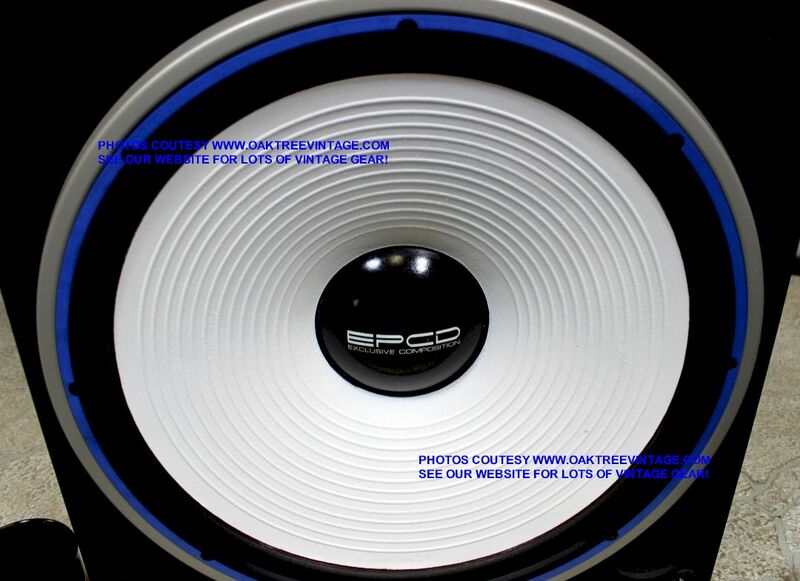 6x2 Horn midrange, AlNiCo magnet. Good cond. Work fine. Stamped Steel frame, Pulp Cone, Pulp surround, Ceramic Magnet. DCR = 6.1 Ohms U 1 $30. ea. Small hole at outer edge. Work fine. Stamped Steel frame, Pulp Cone, Pulp surround, Ceramic Magnet. DCR = 6.2 Ohms U 1 $45. ea. Work great. 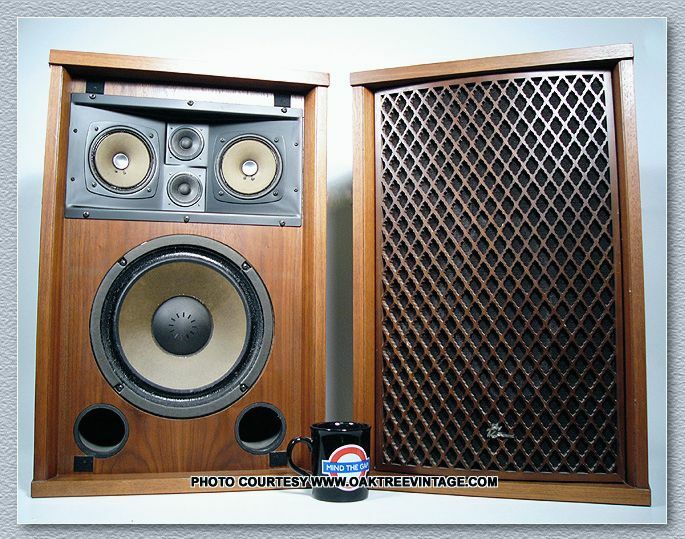 360 Radial Horn tweeter, AlNiCo magnet. Wood frame and lattice grill good, but backing cloth has shrunk, thus is pulling away from top edge. Lattice has a few 'minor' battle scars, but nothing serious, and is structurally sound. 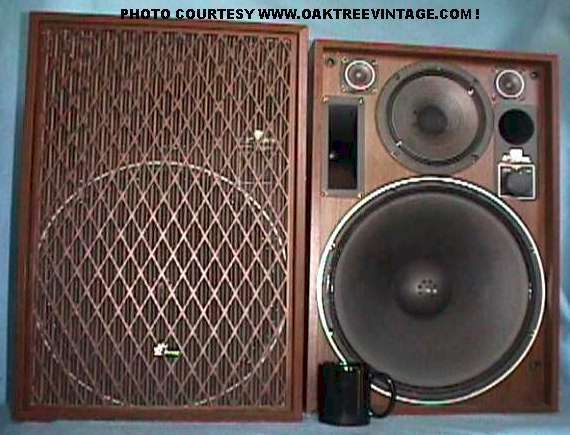 Frame 12" 45 watts 6 Ohms U 1 remaining $75. ea. Good Cond. AF-433 - - - U 2 $45. ea. Good Cond. 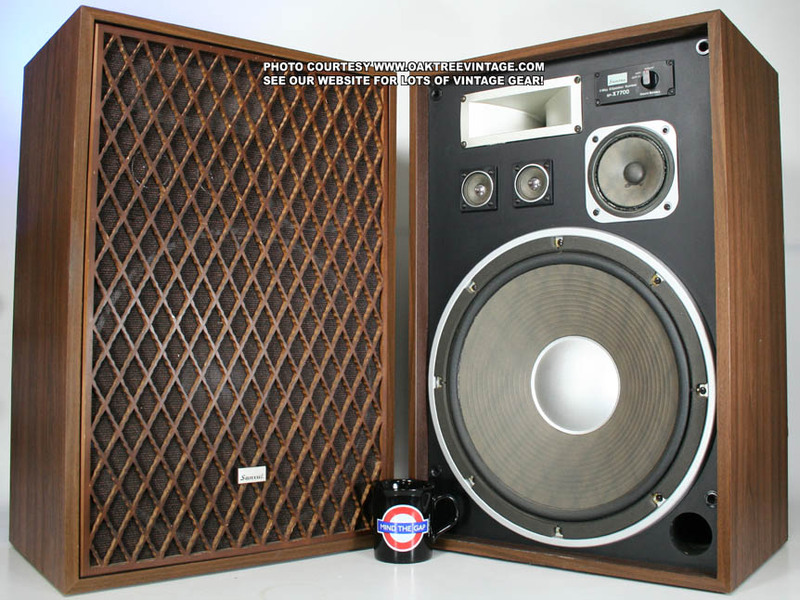 Knobs sold separately. 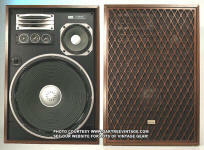 Sansui SP-2700A Attenuator Knobs - - - - U 2 $18. ea. Good Cond. 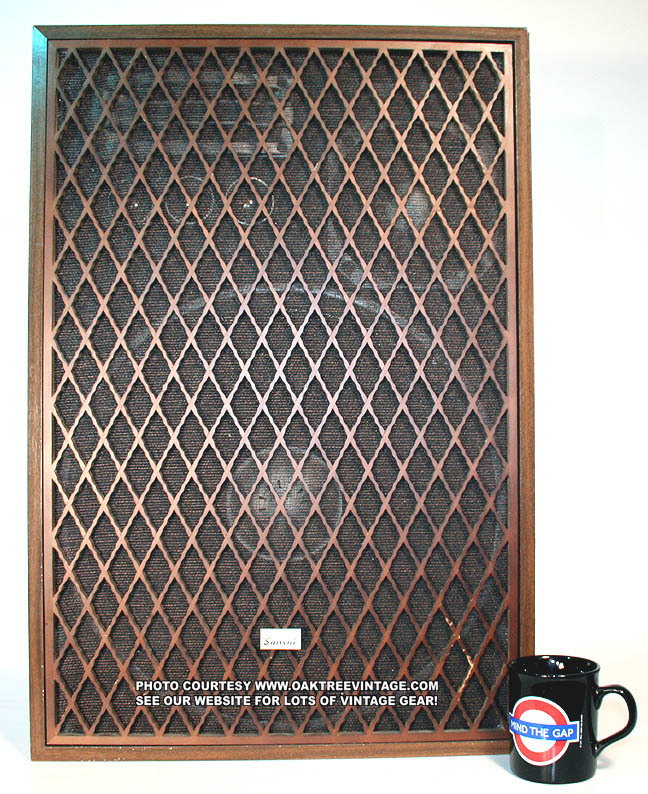 Grills / Grates / Screens / Front Covers Lattice - - - U 2 $25. ea. Good Cond. 4 $20. ea. 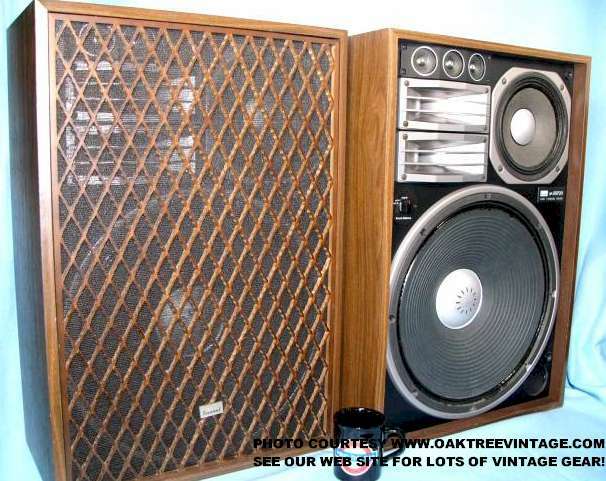 Work and sound fine, but wrinkled from likely being wet at some point in the past. 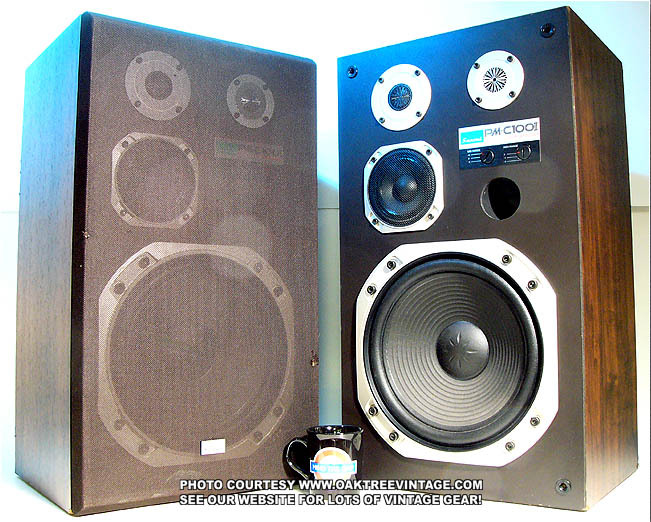 (see also SP-2500, SP-3500) Tweeters T-104 2" 20 14 U 1 $45. ea. ON HOLD FOR POSSIBLE SHOP USE. Good Cond. 2 $45. ea., less knobs Good Cond. Knobs sold separately. 2 $18. ea. Good Cond. Lens - - - - U 4 $29. ea. Good Cond. Pulp cone, Stamped frame, coated cloth surround, AlNiCo magnet, vented / cloth dust cap. 12 U 2 $49. ea. Pulp cone, Stamped frame, coated pulp surround, AlNiCo magnet, silver Mylar dust cap. 12 U 1 $39. ea. Small dimples to dust cap, but works great. Squawkers S-2001 5" - 16 U 3 $39. ea. Good Cond. Pulp cone, Stamped frame, coated pulp surround, AlNiCo magnet, hardened pulp dust cap. $45. ea. Good Cond. with input posts. Knobs sold separately. Wood Kumiko carved grills. Will need lots of cleaning. Dirty / Dusty, cat pee, spider webs etc. No splits, chips, separations, cracks, missing lattice or cloth pulling away. Pulp Cone, non-vented dust cap, Stamped Steel frame (zinc color), Ceramic Magnet, Reverse Cloth Surround. but more MAY occasionally show up. Check back periodically. Integrated housing to seal unit. Pulp cone, paper surround. Squawkers S-2002B 5" 25 16 U 1 $35. ea. Sansui SP-1500 Dome Tweeters T-2002 1" 20 16 U 4 $49. ea. Good Cond. but more MAY occasionally show up. Check back periodically. Good Cond. Knobs sold separately. 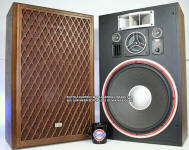 (See also, Sansui SP-200, SP-300, SP-1000, SP-1200, SP-1500, SP-1700, SP-2000, SP-2500, SP-2700, SP-3000, SP-3500, SP-5500 and likely others.) Black w/ brushed 'brite' - - - U 2 $18. ea. Good cond. Excellent with hardly any wear. Sansui SP-70 SP70 Crossover / Input panel w/ input terminals and level controls crossovers cross-overs N-70 2-Way 30 watts 8 Ohms U 1 left $35. ea. Good Cond. Does not include knob. 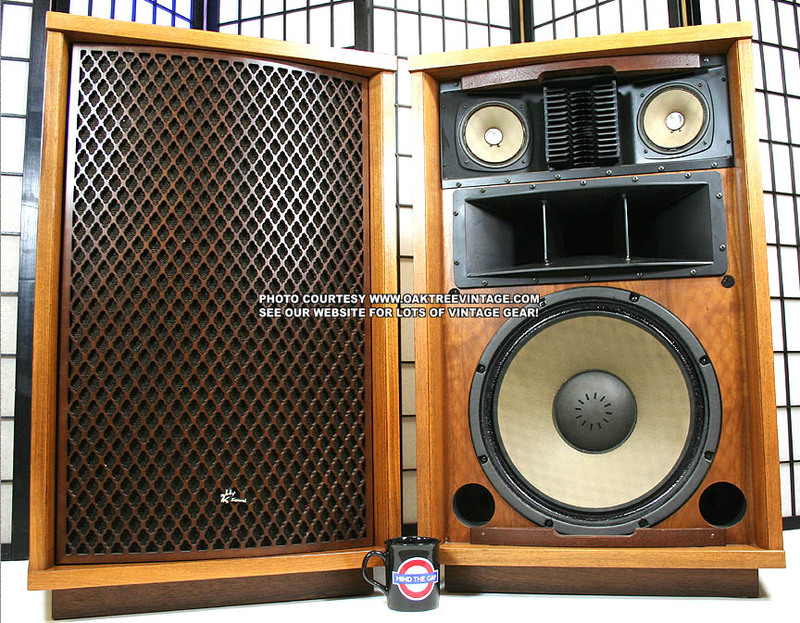 Tweeters T-50N horn tweeter 10 watts 8 Ohms U 2 from SP-30's $30. ea. Good Cond. 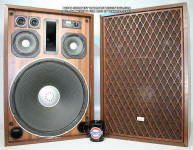 SP35 Woofers W-117 8" w/ AlNiCo magnet 15 watts 7.8 Ohms U 1 $40. ea. Good Cond. 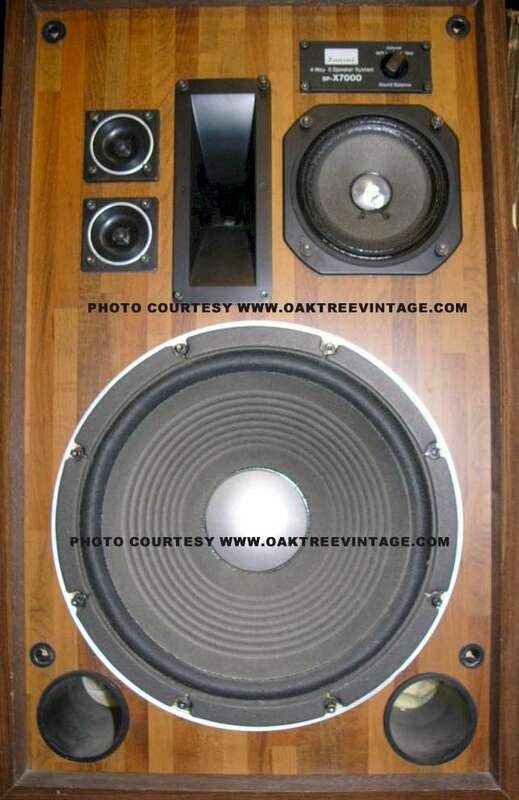 SP35 Tweeters T-116 .75" Dome tweeter 20 watts 8 Ohms U 2 ??? $30. ea. SOLD OR MIA? IF WE LOCATE THEM, WE'LL UPDATE THE PAGE. Good Cond. lattice 17.75" x 10.75" - - U 1 $30. ea. Good Cond. 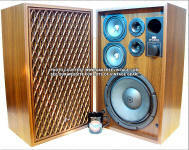 Frequency Response 45Hz-1kHz 100 6 U 2 $40. ea. due to condition. However, shipping will be about as much as the cost of one driver to most states. Fairly 'rough' condition each. Cone 'tearing' away at surround attachment in places around circumference. Dust Caps dented. 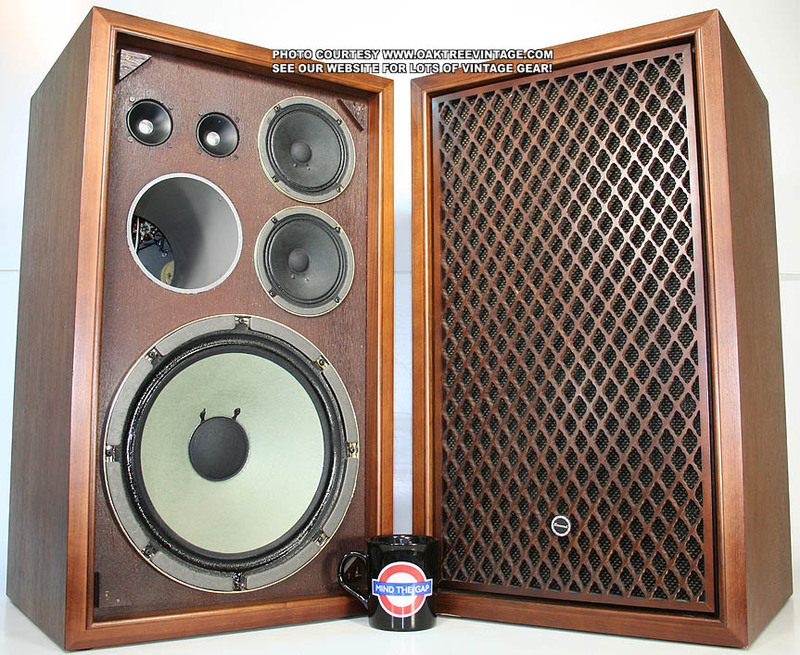 On woofer has a 'nickel' sized hole near it's outer edge (that could be repaired, as the 'flap' is still intact). 'Functionally' they could be resurrected, but not without cosmetic evidence likely. They're almost too bad to list, but not bad enough not to list. 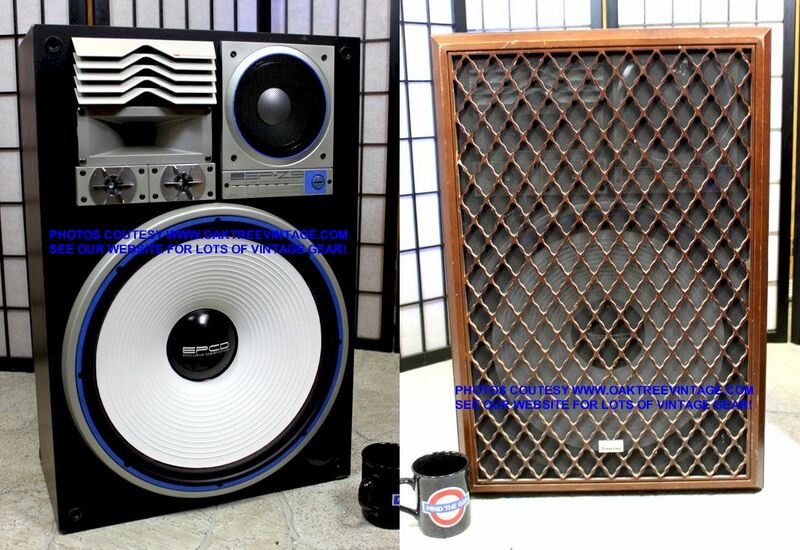 If you are not concerned with cosmetics, and just need to get some correct woofers, that will function, then here you go. That's why they're 'cheap'. 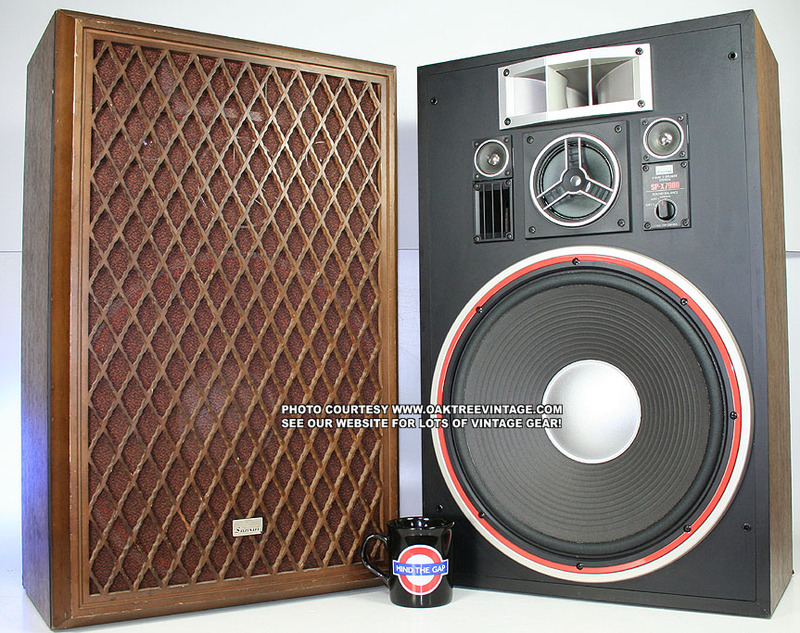 Frequency Response 1Hz-4kHz 50 watts 8 U 1 $65. ea. Good condition with NO issues. 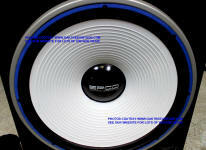 (may be black or silver) 7.25" x 3" 40 watts 12 Ohms U 4 $55. ea. Silver, Aluminum Horn. 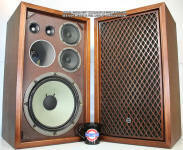 SP-X9 / SPX9 Super Tweeter 'Diffusion' lens / De-fraction louvers - - - - U 2 $30. ea. Plastic Diffusion / de-fraction lens / louvers. Color 7.25" x 3" - - U 2 $20. ea. Good Cond. 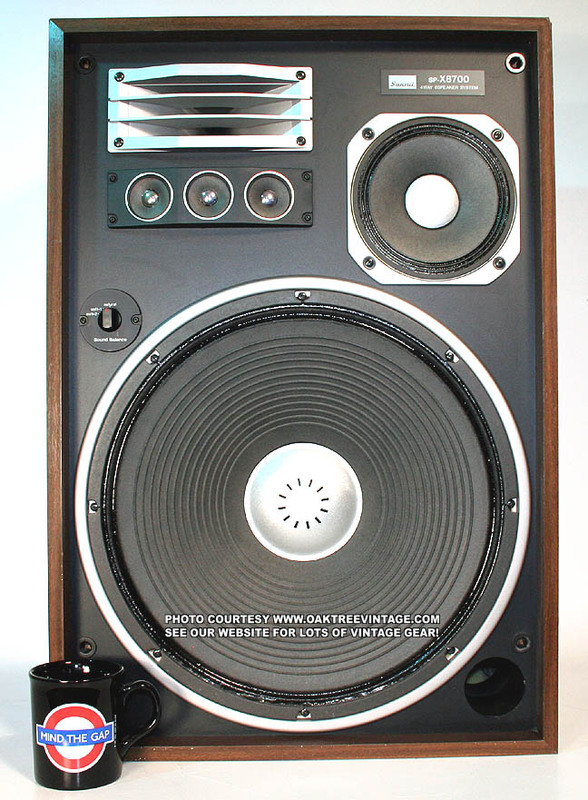 SP-X8 / SPX8 Crossover w/ L Pad -tweeter control / Sound Balance NA-213 4-Way - 8 U 1 $45. ea. Good Cond.. Logo intact. Some splintered lattices, but all mostly intact. Stain would help or recover with normal. Grills / Grates / Screens / Front Covers cloth. Good shape with only minor scuffs / wear. Cone; ribbed, pulp w/ vented dust cap in 'matte' silver and paper / accordion surround. Frame; Stamped steel, zinc finish. Cone; pulp w/ dust cap in 'matte' silver and paper / accordion surround. Frame; Sealed, Stamped steel, zinc finish. but more MAY occasionally show up. Check back periodically. Two horns, molded together. (see also SP-X8700 & SP-X9700) 17"
but more MAY occasionally show up. Check back periodically. 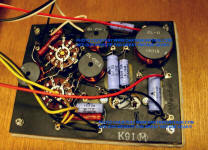 Good Cond..
1k-4kHz 50 watts 8 Ohms U 1 $65. ea. Good Cond. SPX8700 Horn's diffusion lens - 7" x 2" - - U 1 $35. ea. Good Cond..
but more MAY occasionally show up. Check back periodically. 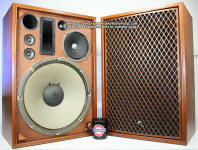 Sold in 'Three's' as they are too difficult to remove from mounting bezel. 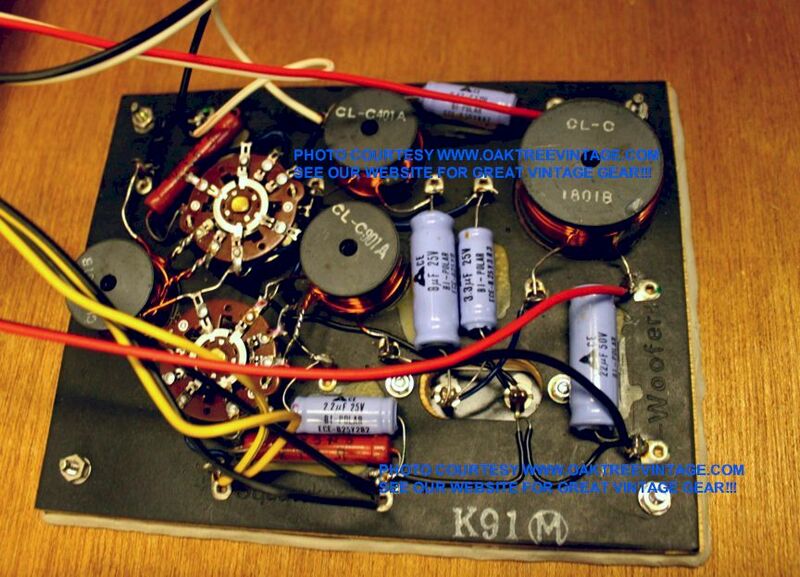 1k, 6k & 10kHz 220 watts 8 Ohms U 1 $55. ea. 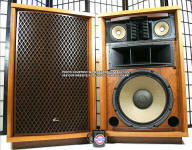 Good Cond..
DCR = 5.3Ω U 1 $95. ea. Good cond. DCR = 5.3Ω U 1 $65. ea. Dust imbedded in cone paper. Scratches on silver dust cap. Functionally fine. DCR = 11Ω U 2 $45. ea. Good cond. DCR = 11Ω U 2 $35. ea. Dented dust caps. (cosmetics only). Function fine. DCR = 6.6Ω U 1 $55. ea. Fine cond. Black finish. 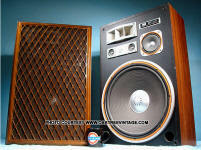 160 Watts 8 U 2 $75. ea. Good Cond. 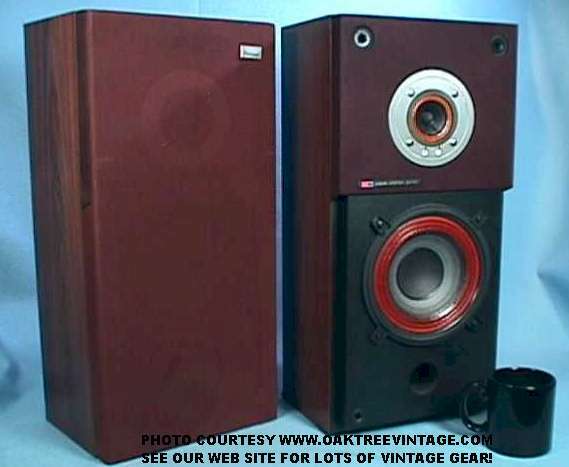 (See also SP-X7700, SP-X7900, SP-Z7-II as possible substitutions) Woofers W-192B 15"
(see also SP-X7700 & SP-X7900) 4.5"
DCR = 10.6 U 1 $55. ea. Silver in finish. 4-hole mounting flange. Fine / Good Cond. 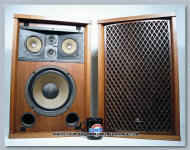 (See also SP-X7700, SP-X7900, SP-Z7-II as possible substitutions) Woofers W-192 15"
DCR = 4.8 U 2 $115. ea. Vented via rear located vents in cone. DCR = 4.8 U 2 $65. ea. Cat urine / pee sprayed. Works fine, but don't purchase if you have cats, as they would continue to be a 'target'. Even though you can't smell it, a cat will be able to. $55. ea. Fine / Good Cond. DCR = 10.6 U 2 $55. ea. Silver in finish. Fine / Good Cond. DCR = 7.0 U 4 $30. ea. Fine / Good Cond. Sansui SP-X7700 Crossovers N-189 / SP-X7700 4-Way - - U 2 $45. ea. Good Cond. Ribbed, Pulp cone. Cloth, roll surround. Silver painted, pulp dust-cap. Stamped steel frame. Ceramic Magnet. Good Cond. Ribbed, Pulp cone. Coated, cloth, 'accordion' surround. Silver, Mylar dust-cap. Stamped steel frame. Ceramic Magnet. Cosmetic dents to aluminum dust cap. Driver Works and sounds great! but more MAY occasionally show up. Check back periodically. Cast Aluminum Horn w/ AlNiCo magnet. SPX7000 Crossover - 4-way 130 watts - U 2 $55. ea. Good Cond. 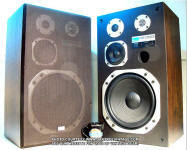 SP-X6700 / SPX6700 Woofers W-191E 13"
SPX6000 Woofers W-174 / W174 10"
T-157 / T157 2 3/8"
DCR = 5.6 Ohms U 2 $105. ea. Refinished in 'bright white'. EPCD (Exclusive Composition), White, Pulp cone. Stamped Steel frame. Ceramic magnet. Black and Blue, front rubber gasket / trim. but more MAY occasionally show up. Check back periodically. Aluminum horn. Ceramic, vented magnet. 6 (2 extra in the 'centers' of the 'long dimensions') mounting holes. No magnet covers on this version. 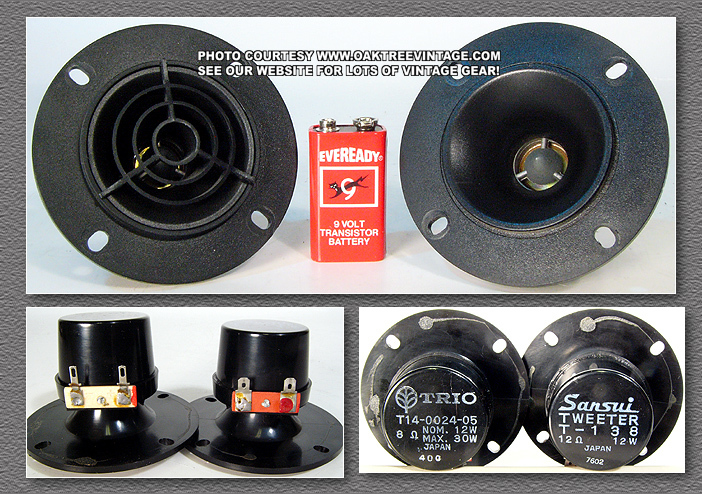 Horn Upper-Tweeter T-210 / T210 3 7/8" X 2 1/2" Horn perimeter - DCR= 11 Ohms U 2 $45. ea. Aluminum horn. Ceramic, vented magnet. Louvers / diffusion lens sold separately. T-211 / T211 .5" - N/A / PIEZO U 1 $35. ea. Piezo with Mylar 'chrome'. We recommend that the terminal / back plate attachment to the plastic housing be reinforced. The attachment points are fairly minimal, especially considering the stiff, oversized wire used to connect them. Additional glue, epoxy, liquid metal or similar should be added to the original edge glue for added security. 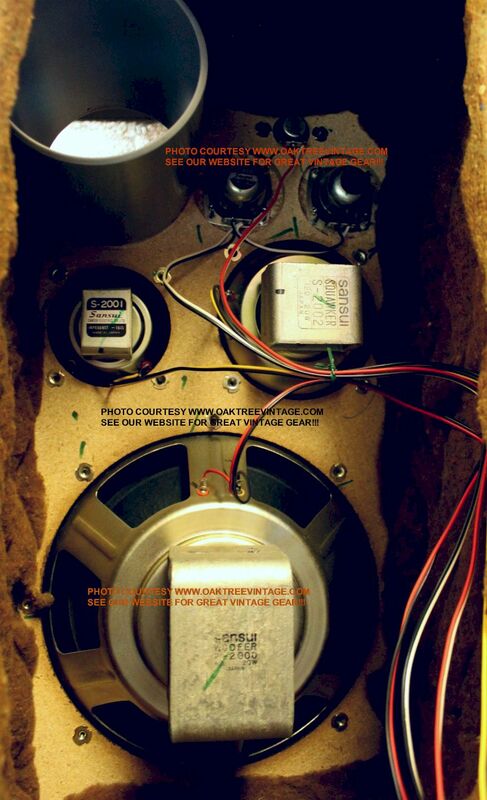 Be very careful removing the super tweeter assembly, as the stiffness of the wires is enough to dislodge the terminal plates. 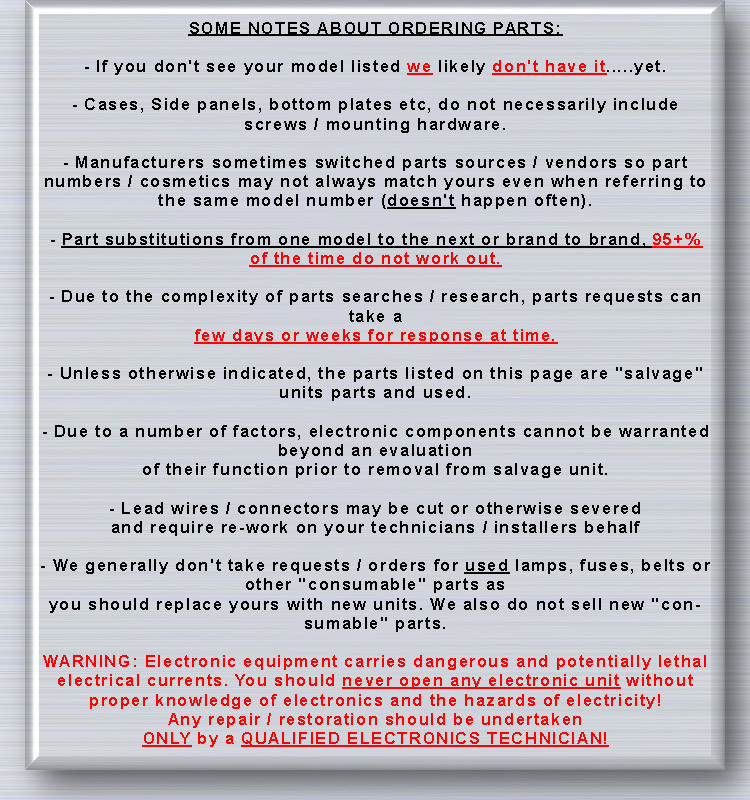 We do sell replacement piezo elements for these, but it is a 're-engineering' feat to get them installed. T-211 / T211 .5" - N/A / PIEZO U 1 $25. ea. Piezo element. 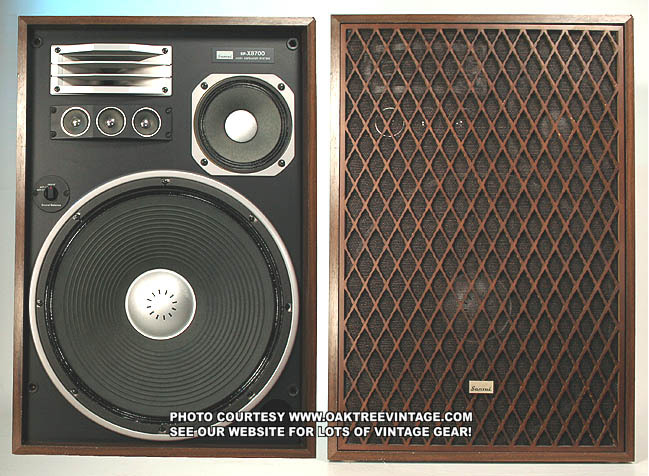 This is DIY and will require some re-engineering to retro fit. We use a Dremal with a 'cut-off' wheel, 'gel' super glue & JB weld to re-attach. We recommend that the terminal / back plate attachment to the plastic housing be reinforced. The original attachment points are fairly minimal, especially considering the stiff, oversized wire used to connect them. Additional glue, epoxy, liquid metal or similar should be added to the original edge glue for added security. 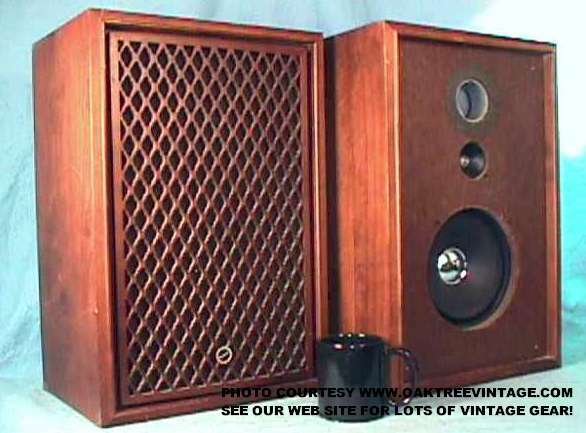 Be very careful removing the original super tweeter assembly, as the stiffness of the wires is enough to dislodge the terminal plates. If yours 'tears / rips out', then you can repair it with these piezo elements. Upper, Blue Rack $30. ea. Good cond. Utilize double stick tape to attach. Pry off VERY carefully and slowly to remove. but more MAY occasionally show up. Check back periodically. EPCD (Exclusive Composition), White, Pulp cone. Stamped Steel frame. Ceramic magnet. Black and Blue, front rubber gasket / trim. 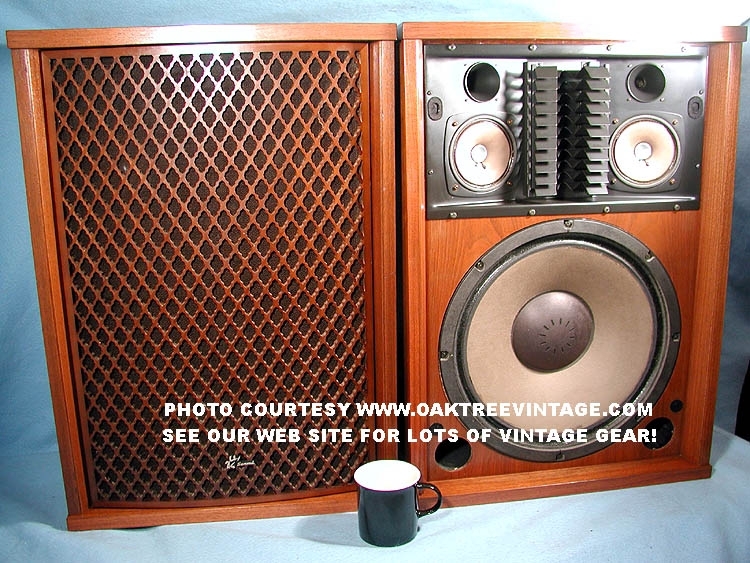 SANSUI Cast Frame Tweeter. 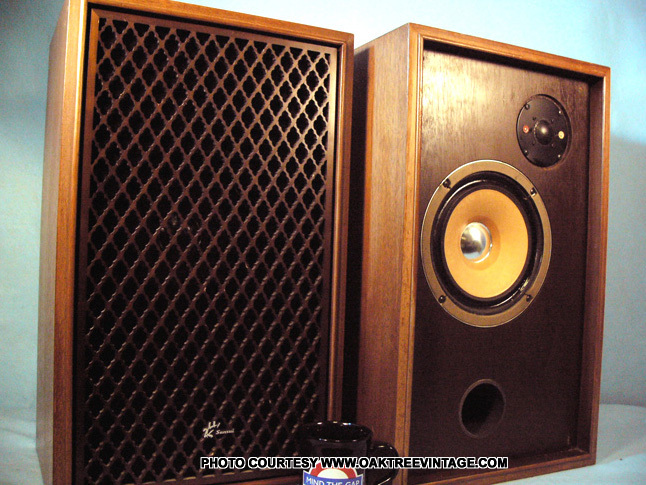 Similar to JBL LE-25 / LE25 tweeter T-153 / T153 10"
Mounting plates ~ 5 5/8" on a side.